I believe in Magic. I don’t mean “stage magic” … illusions produced for entertainment. I do enjoy “stage magic”, but that’s not the subject of this post. I’m talking about real Magic … the production of miracles. Many consider the term real Magic an oxymoronic juxtaposition that doesn’t exist. Many who allow for the possibility of real Magic, believe it to be something mysterious or evil … a genuine source of terror. The art of producing a desired effect or result through the use of incantation or various other techniques that presumably assure human control of supernatural agencies or the forces of nature. Compare contagious magic, imitative magic, sympathetic magic. Although this approaches what I mean by the term “real magic”, I’m immediately troubled by the word “supernatural”. Because we and “extra substances or chemicals” are part of nature, definitions 1 and 2 are not relevant to this discussion. That leaves “usual or expected”. Usual to whom; expected by whom? What some may find unusual, I find interesting. The more I learn; the more I expect. Of, relating to, or seeming to come from magic, a god, etc. Number 1 seems rather arrogant. If we can’t explain it, it’s not natural? If that’s true, learning anything that changes science or our understanding of the laws of nature must itself be magic. Is learning and expanding knowledge magical? Works for me. In that case Homo sapiens sapiens (aka modern humans) has experienced a lot of magic in the past 50,000 years or so. Even when you assume that some things are outside of Nature (e.g., God, ghosts, souls, etc.) or beyond what’s “Normal” (e.g., telepathy, remote viewing, prophecy, etc. ), there are some who apply the words “Supernatural” and/or “Paranormal” to phenomena only because we can’t prove or explain them. UFOs aren’t supernatural or paranormal. They’re unidentified. People are seeing something. We just don’t know what. Maybe they’re space ships. Maybe they’re interdimensional ships. Maybe they’re time machines. Maybe they’re hallucinations. Maybe they’re some mix of all four. Maybe they’re something we have yet to imagine. It seems highly unlikely that they’re supernatural. Cryptids are similar. Many people report seeing something. It’s just hard to determine what. Supernatural is a really inaccurate word to apply to cryptids because many former cryptids have proven to be real animals. If you want a closer look at the thin line between science and magic … if you choose to believe there is a difference …, consider the concepts of quantum theory. The original purpose of the Double Slit Experiment was to demonstrate that light could function as both a wave and a particle (called a photon) depending upon the way one looks at it. As if light behaving this way weren’t strange enough, later applications of the procedure showed that larger particles (electrons, protons, even molecules) showed wave-like properties as well. Particles shot at the double slits one at a time produce a result that one would expect to see if the single particle went through both slots at the same time. Albert Einstein did not like Quantum Entanglement. He called it “spooky action at a distance”. (Remember, that’s from the man who discovered Special and General Relativity.) Quantum entanglement seems to violate causality. Once again, the particles didn’t get the message. Experiments seem to demonstrate the results predicted by the concept of quantum entanglement. A multitude of possibilities collapsing into objective reality because someone measured it, every possibility becoming part of a new reality, reality being determined by a guiding equation, all that is existing because of infinitesimally tiny strings vibrating in an n-dimensional space (where n is 10 or more), and a fundamental uncertainty functioning at the base of everything … these are just a few of the strange ideas about the Wonderland of the quantum level. How big is the Universe? Is it infinite? If it is, what does that mean? If not, what’s outside? If the Universe is expanding (as it seems to be), what’s it expanding into? Is there a Universe or a Multiverse? If the Universe is infinite, every possibility exists. As far as we can see, the Universe looks about the same … galaxies, galaxies, and more galaxies … all rushing away from each other at ever-increasing speeds with the expansion of space-time. Eventually, they’re moving so fast that we can no longer see them. Everything moving within space-time is limited to the speed of light, but the Theory of Relativity does not limit the expansion of space-time itself. If the Universe is finite, there must be something beyond it, right? Not necessarily. As soon as one starts thinking about something about “outside the Universe (or, if you prefer, the Multiverse)”, logic gets in the way. If there’s something outside the Universe, what’s outside of that? Why is that whatever-it-is not part of the Universe? 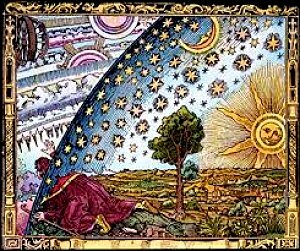 Which came first Consciousness or Matter; Science or Magic? We stand at the center of All That Is … between the infinitely small and the infinitely large. Whether we look up or down; outside ourselves or within, Mother Nature’s tricks beat those of the stage magicians every time. Whether it’s science or magic or both or neither is ultimately irrelevant. We will cease to exist as a species, the Stars will dim, and the Universe will be cold and motionless long before we could ever run out of mystery … and learning.